Focusing in on Madison and Gallatin Counties in Montana, the blue and green county on the bottom left where Bozeman is located. William Barclay was younger brother to Alexander and George Barclay. He first appears in the 1865 Minnesota State census with his parents John and Ellen Barclay along with his brother Charles. Some ancestors grab your attention and William is one of them for me. I ponder what sent him to Montana and why he stayed there. He is present in the 1870, 1875, 1880, 1885 census of both the US and Minnesota. See the previous post on his brother Charles for more details the John Barclay Family. Sold for $300.00 follows to-wit: Lot #4 of Section No. 8, Twp. 115, north of Range 21, West containing 33 and 90/100 acres. According to government survey of the same ____ records. Signed by William Robinson and Hannah Robinson, August 30, 1887, etc. Filed for record Aug. 30 AD 1887 at 2 p.m., Witnesses Jane? McDale, Patrick W. Farcy. Source: Registrar of Deeds, Scott Co., Minnesota Vol. L2, pg. 116, Scott Co., Minnesota, Family History Film #1255723 (not 1403552). For the sum of $2,000 a parcel of land in the County of Scott as follows to-wit: the NE qtr of the NW qtr and the NW atr of the NE atr, Section 12, Twp. 115, Range 22 containing 80 acres – gov. survey less the right of way of the Saint Paul and Sioux City Railroad, except a certain mortgage of $1000, dated July 10, 1889 payable to Ellen L. Haywood recorded at the county seat of Scott Co., Minnesota July 15, 1889 in Book x of Mortgages, Page 107. Witnesses Ella M. Wells and C.E. Van Doren of the County of Hennepin). William Barclay, a single man personally appeared before me. Signed by William Barclay. Source: Registrar of Deeds, Scott Co., Minnesota, Vol. 39, pg. 21, Instrument #4261, Scott Co., Minnesota, Family History Film #1255725. John and Ellen Barclay sell land to William Barclay on 18, July 1892. This is why I think John Barclay did not have a probate/estate for he sold his holdings to his wife and sons. Sold for $1100.00, the South half (S1/2) of the NE qtr (NE1/4) Section twenty-three (23), Township one hundred fifthteenth (115) Range twenty-two (22). Reserving the crops now standing and growing thereon and the right to harvest the same during the season of 1892. Except a mortgage of $700 and interest recorded in book R of Mtges page 113 etc. Witnessed by Julina A. Coller and John Thiem and signed by Helen Barclay and John Barclay etc. 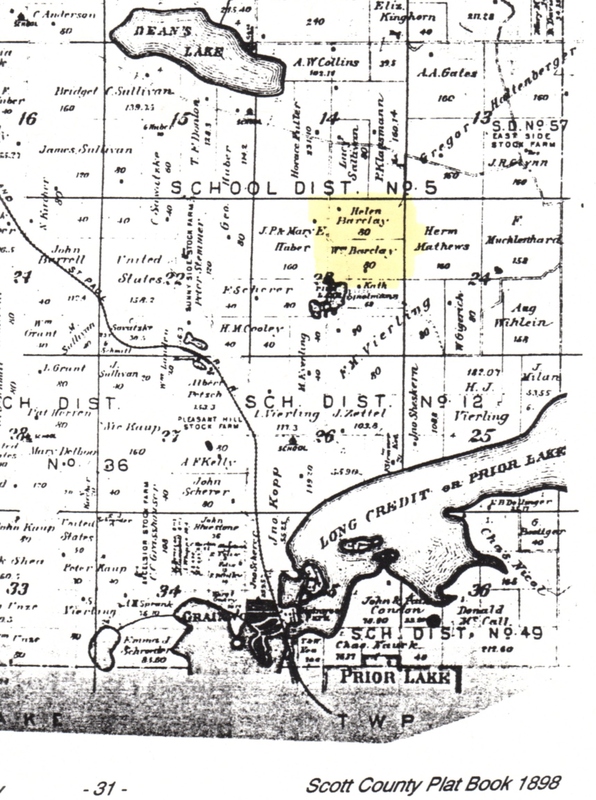 Source: Registrar of Deeds, Scott Co., Minnesota Vol. 40, Pg. 359 #6877, Scott Co., Minnesota, Family History Film #1255725. On 1 December 1894 William gets married in Hennepin Co., Minnesota to a Clara E. Sweker who may have been a divorcee. Source: Application for License County of Hennepin, State of Minnesota, singe by a A. J. [Wizer] Deputy Clerk. The 1898 atlas for Scott County lists Helen/Ellen Barclay, the mother, and William Barclay in Twp. 115 North Range 22 5th Principal Meridian (Eagle Creek) Section 23 in the northeast corner. In 1899 William is the grantor in another deed where he sells land to his brother Charles Barclay. He is now living in Montana. For a sum of $1800.00, Wm. 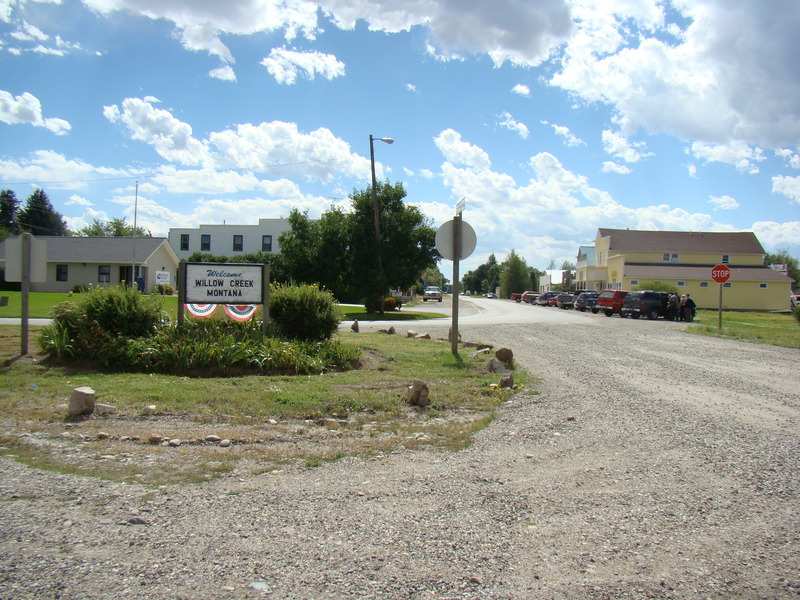 and wife Clara E. Barclay are residing in Mammoth, Madison Co., Montana at sold to Charles Barclay residing in Eagle Creek, Scott Co., Montana to-wit, the south 1/2 of the NE qtr of Sec. 23, Twp. 115, Range 22 80 acres according to gov. survey. Except a certain mortgage payable to Henry Hinds of Shakopee. Witnessed by W.R. Macfadden and F. H. Wilbour and signed by William Barclay and Clara E. Barclay in the State of Montana, County of Madison etc. Source: Registrar of Deeds, Scott Co., Minnesota,13 February 1899, Vol. 47, pg. 330 #12062, Scott Co., Minnesota, Family History Film #1255727. We find William and Clara Barclay living in Montana in 1900 and they have a little son. Line 10, Dwelling #131, Fam#82, Barcley, William, Head, W, male, Dec. 1862?, age 37, married, 10 yrs., born Minnesota, father born Scotland, mother born Norway, occupation miner, # months not employed is 0, can read, write and speak English, owns, house. Clara E., wife, white, female, July, 1858, age 41, married 10 yrs., one child born, one child living, born in Wisconsin, Father born in Iowa, mother in New York?, can read, write and speak English. Foster, son, white, male, born Oct? 1891, born in Minnesota, father born in Minnesota, mother born in Wisconsin, at school 4 mos., can read, write and speak English. Source: 1900 U.S. Federal Census, Madison Co., Montana, SD 278, ED 54, Sht#7, 278, 4889. Restless again, William heads to Idaho and is there by 1910 and sadly it looks like Foster didn’t survive. I have not been able to find a grave for him. line 36, 72, 72, Barclay, William, Head, M, W, 49, M, 20 years, born Minnesota, father Scotland, mother Norway, Farmer, Barclay, Clara E, Wife, F, W, 52, M2 20, 1 child born 1 child dead, born Wisconsin, Father born Minnesota, mother born New York. speak English, read and write. Source: 1910 U.S. Federal Census, Gold Precinct, Latah Co. (Does not exit now), Idaho. SD 46, ED, 183, Sht 3A #6739, 26 April 1910, Merlton G. Swatman. In 1920 William has returned to Montana, he is now widowed. He settles in Hot Springs, Madison County. Line 44, Dwelling#121, Fam#121, Barclay, William H., Head, home owned, free of mortgage, male, white, age 57, widowed, attended school, reads and writes, born in Minnesota, father born in Scotland, spoke English, mother born in Norway, spoke Norwegian, can speak English, occupation farmer, general farm. Source: 1920 U.S. Federal Census, Hot Springs, Madison Co., Montana, SD 1, ED 136. William moves to Willow Creek in Gallatin Co., Montana by 1930. Line 21, 48/51, Barclay William M. Head, Owns,$250, yes, male, white, 68, widowed, age of first marriage 20?, has not attended school since 1929, able to read/write, born in Minnesota, father born in Scotland, mother born in Norway, speaks English, occupation Poultry farmer, same, own account, at work yes, not a veteran, No. 44 on farm schedule. Source: 1930 U.S. Federal Census, Willow Creek Gallatin Co., Montana, ED 16-34, SD 9, Sht 3A, 158. Much to my delight some wonderful individual has posted a picture of the tombstone of William and Clara E. Barclay at Find A Grave. They are in the Valley View Cemetery in Pony, Madison Co., Montana. http://www.findagrave.com/cgi-bin/fg.cgi?page=gr&GSln=Barclay&GSfn=William&GSbyrel=all&GSdyrel=all&GSob=n&GRid=70132161&df=all& Pony is further west and a little south of Three Forks. This tombstone agrees with the death dates I have for William and Clara E. Barclay. William died 7 December 1937 Gallatin Co., and Clare E. died 21 March 1919, Madison Co. In 2010 we had a wedding to attend in Bozeman on my hubby’s side of the family. So I decided to go and visit my Spracklin cousin in Miles City. On the way back we stopped and visited various places and societies. We did some side trips and one was to Willow Creek were William had lived. To get to Willow Creek you go west on I-90 to almost 287 and then into Three Forks and then follow the road south. This entry was posted in Alexander Barclay, Charles Barclay, Clara E., Eagle Creek Township, Gallatin County, Helen/Ellen Stevenson or Iverson, Hennepin County, Idaho, John Barclay, Madison County, Montana, Scott County, Valley View Cemetery Willow River MT, William Barclay and tagged Hot Springs MT, Latah County, Mammoth MT, Pony MT, Willow Creek Montana. Bookmark the permalink. As always, I enjoy your posts. my question for this one is, where did you get that colorful map? I’d love to find some different states for a post or two of mine. Thank you.